File photo by Travis Rosenau Nick Labat of Sleepy Eye VFW Post 800 fouls off a pitch to stay alive in Friday’s subdistrict playoff game with Hutchinson in Sleepy Eye. 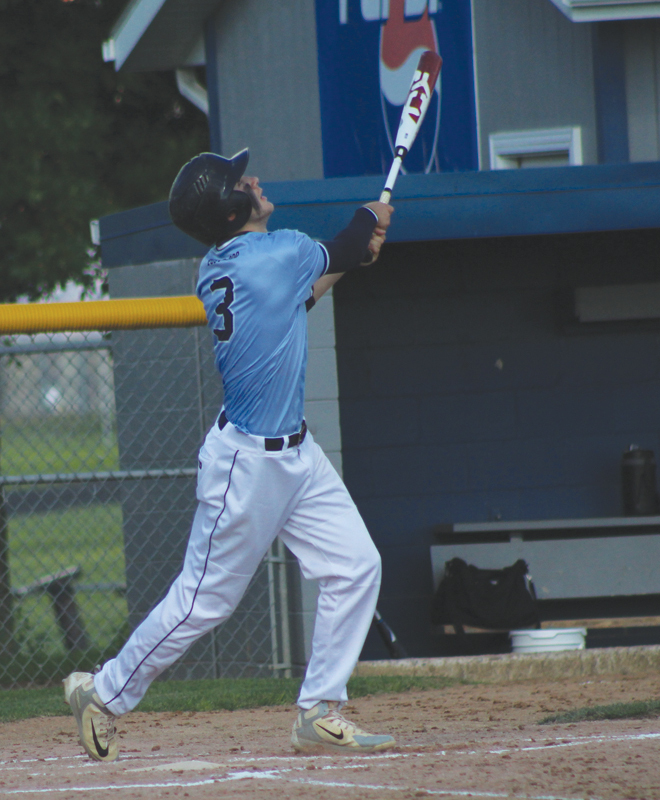 SLEEPY EYE — The Sleepy Eye VFW Post 800 baseball team held on in dramatic fashion to defeat Lake Crystal 8-7 in the first elimination game of the subdistrict tournament on Saturday. They then got payback on Hutchinson from a day earlier by picking up a 14-5 win. That win moves Sleepy Eye on to a meeting with New Ulm VFW Gold at noon on Sunday in the title game in Sleepy Eye. In Game 1, Sleepy Eye’s Henry Scheitel hit a two-out, two-run single in the top of the fifth inning to give Post 800 the right to play Hutchinson later on that evening. Scheitel’s single was his second multi-RBI hit of the game. Lake Crystal, in the bottom of the seventh and down by two runs, added a run early in the inning by putting runners aboard. Evan Mann led off the inning with a deep drive into the left-field gap for a stand-up double to get things moving for Lake Crystal. Brenden Jones singled to bring in the runner with one away as the bats began to warm up facing elimination. Sleepy Eye’s Kyle Goblirsch sprawled out to his left and caught a low line drive to rob Austin Nickels of a hit. Goblirsch then had the easy throw to first to double up Jones and end the game for Sleepy Eye. Post 800’s Goblirsch pitched 2 and 2/3 with five runs and given a no decision for his efforts in the first game. Spencer Hoffmann was called in to pitch after Lake Crystal put four runs across in the third inning, taking a 6-5 lead. Lake Crystal’s four-run third inning came from just two hits and three Sleepy Eye errors. Lake Crystal’s first two batters reached on infield errors and Mann hit a sharp RBI single into left to bring in Jake Maas from second. Logan Shay followed with a soft single into right to fill the bases for Lake Crystal. Jones hit into a 4-3 fielder’s choice to score Jaret Born, followed by a two-out walk to fill the bases again for Lake Crystal. Sleepy Eye was charged with another infield error and a walk delivered by Goblirsch ended his appearance as Sleepy Eye looked to Hoffmann to end the inning. Hoffmann was able to get a 6-4 groundout to end the inning as Sleepy Eye now trailed 6-5 going into the bottom half of the third. Hoffmann pitched 4 2/3 innings with two strikeouts and gave Sleepy Eye two 1-2-3 innings as the winning pitcher. Nick Labat singled in the top of the fourth inning to lead off and took second and third from a stolen base and a wild pitch. Consecutive walks to Hoffmann and Scheitel loaded the bases for Sleepy Eye with Labat still at third. Kadon Strong was able to draw a walk that scored Labat as Sleepy Eye tied the game at 6, still in the fourth inning. Goblirsch then reached on a fielder’s choice with Hoffmann being thrown out at home as Sleepy Eye fought to retake the lead. Post 800’s go-ahead run came in the fifth inning when Scheitel drove a deep shot into straight away center field to score Ethan Fischer and Labat with two away in the inning. In Game 1, Scheitel went 3 for 4 with four RBIs and a walk, Labat went 2 for 4 with a walk and Hoffmann went 1 for 3 with an RBI. Lake Crystal’s Blaine Zernechel took the loss, going five innings with seven strikeouts and Nickels gave two innings with three strikeouts. In Game 2, Labat went 2 for 4 with an RBI and four runs scored, while Scheitel added two hits, two runs scored and an RBI. Matthew Sellner and Jackson Huiras each added a hit and two RBIs. Sellner got the win over Hutchinson with six innings of work. He allowed three earned runs and had three strikeouts.